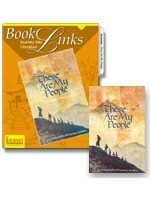 BookLinks: These Are My People is geared toward the advanced reader. It is an enhancement of the lesson plans for These Are My People found in the first edition of the Reading 3 Teacher's Edition. An in-depth study of this junior novel links literature to content areas and life skills. A laminated folder provides background information, enrichment activities, and useful storage pockets. The 60-page guide includes lessons, practical Scriptural applications, and dozens of reproducible activity pages. Use BookLinks to challenge the advanced reader, enhance basic instruction for the average reader, and interest and motivate the struggling reader. Includes teaching guide and novel. Grade 3.